This is a 12″ block that I created to be included in a group collaboration quilt. A textile group I belong to, the Fiber Arts Bee, is creating a group quilt. Our members dyed fabric and then gave a piece to everyone to create a 12″ block. I neglected to photograph the fabric before I altered it, but it was quite lovely in greens and hint of purple. It is the background fabric in my block. For this block, I worked differently in my quilting and cutting apart technique. This block will need to be pieced to other blocks and then have batting added, so I couldn’t add the batting and backing and then reconstruct it. Instead I took the background fabric and painted it in a shade of turquoise with an awesome commercial zebra stamp I found, and then put a very strong fusible interfacing on the back. I then fused the batik strips down, sewed and zigzagged them. At that point I carefully cut it up and reassembled it. I can’t wait to see the blocks from the other artists and the finished quilt! This is my weekly journal quilt 37/52 2008, 6″ x 8″. I made this piece while thinking about Hurricane Ike and watching images of the water, winds, and storm. Thankfully my very special loved one was able to evacuate safely at work in plenty of time preceding the storm. This piece was created using two pieces of one of my favorite black and white prints that I over-dyed in two different colors. It really took the colors or turquoise and lime green nicely! I started with a black solid piece of fabric for the background. I cut out the spiralling pieces of over-dyed fabric and fused them to the background fabric. I stitched/quilted the piece to the peltex base with solid black thread. I added a solid back piece and zig-zagged the edges to finish the piece. This is my weekly journal quilt 36/52 2008, 6″ x 8″. The background for this piece is a hand dyed and stamped piece I created, and I’ve been looking at for a couple of months. I stamped the circle/egg shapes while the piece was wet, and I love the soft way the shapes appeared. I was reluctant to put anything on top of it, but I have to be brave sometimes, right? 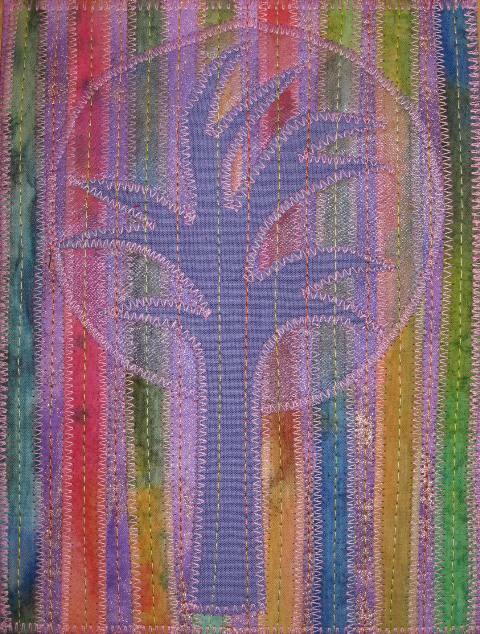 I fused down purple batik strips in circle/egg shapes on top of the background. I’m exploring a quilt idea with concentric circles, so this is a bit of a beginning for that idea. I quilted the piece to the peltex interfacing, added a plain back, and then zig zagged the edges to finish. This is my weekly journal quilt 34/52 2008, 6″x8″. I am inherently very attracted to linear patterns, and I wanted to try working with a more curvilinear pattern. So, for this piece, I fused a traditional Celtic design as my journal quilt. The background is a piece that I painted in a circular pattern with fabric paints in various shades of blue. The Celtic pattern was created with a solid blue piece of Kona cotton. I quilted the piece in a wavy pattern with blue/teal variegated thread. To finish the piece, I zig-zagged the edges.